A collection of some of the author’s previously published essays and book reviews on race, immigration, refugee policy and related aspects of American society. In addition to his views and reviews are summaries of interviews with leading figures and field workers engaged in the rescue, relief and resettlement of refugees and observations of and commentaries on those caught up in the aftermath of the wars in Vietnam, Cambodia and Laos. The research was conducted in the course of a study of the making and implementing of U.S. refugee policy. 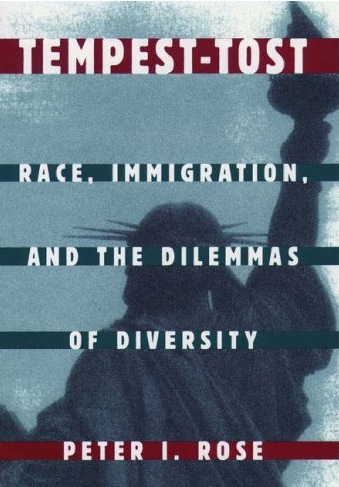 Over the past several decades Peter Rose has established himself as one of the field’s most incisive and compassionate writers on questions of American diversity. This collection, twenty-nine essays published between 1981 and 1991, revisits some of the key issues that have commanded public attention in recent years and offers an engaging record of this scholar’s rare sensibility. As the author himself reflects, none of these essays “can said to be entirely ‘value-free.’ These are personal analyses, accounts, assessments and critiques. The volume’s chief interest might ultimately reside not in what it has to teach about refugee policy, racism, or inter-group relations — though it has much to tell us on these themes — but on its enchanting retrospective on Rose’s intellect at work….. The intellectual heart of the collection is the section on refugees and the worldwide bureaucracy that has evolved to manage their movements, the “Caretakers, Gatekeepers, Guides, and Go-Betweens,” as Rose enumerates them. This is Rose at his best: informative, energetic in his research, careful in his analysis, and always heartwarmingly human…. If the passages on refuge represent that intellectual and political heart of the volume, perhaps the the sweetest surprise of the collection is the section devoted to book reviews. It is a testament to Rose’s elegance as a thinker and a writer that these dated reviews of long-familiar books are not only worth reading but are in fact a real pleasure…. ….It is among the beauties of Tempest-Tost and among it’s author’s rare achievements that here is a book which specialists will not only ransack but will savor. Peter Rose’s essays on issues of immigration and race, written over a decade’s time, stand in sharp contrast to much recent literature on these subjects. While the output of scholars in the past few years has focused heavily on statistical methodology and issues of economic and workplace impact, Rose’s concerns center on issues such as broad social integration, the quality of services given to immigrants and refugees, and the ethics of care. The book is organized in three sections…. Three themes run throughout all of these sections. First, while Rose movingly recounts the difficulty of immigrant journeys and the hardships of adjustment, especially of the first generation, he concludes that recent newcomers, particularly the Asians on whom he focuses, make a successful economic and social adjustment in the new country. Third, Rose’s optimism wanes when he compares the brights prospects of newcomers with the ongoing difficulties of African-Americans. He notes that the immigrants “threaten the interests of blacks as they — like their earlier counterparts from Europe — move in, up, and over….This “American Dilemma” still needs serious attention. In both his optimistic assessments of newcomers and their helpers and his more grim view of race relations, Rose provides that there is still much to be learned from older sociological methods of close observation, careful interviewing and insightful writing. In Tempest-Tost Peter Rose distills 40 years of teaching and research on race, ethnicity, and international migration. Few readers will finish this book without feeling humbled by the breadth of Rose’s expertise. He is as adept at analyzing the provision of social services to Southeast Asian refugees as he is in explaining the origins of contemporary nativism. Yet, Tempest-Tost is anything but overwhelming. Rose has a unique writing style that gives the reader the impression of being part of a conversation…. While the book is a collection of previously published articles, book chapters, and book reviews, the variety of readings makes it more accessible than many a monotone monograph. Rose’s understanding of diversity is rooted in Simmel’s work on the stranger and Park’s concept of marginality. These ideas have never been as central to sociology as have been the concepts alienation (Marx) and anomie (Durkheim). But Rose skillfully weaves the themes of exile and ambivalent identity throughout the book to spotlight the dilemmas of diversity. Rose is a sociologist who has studied ethnic relations in America for the last 40 years. In the late 1970s, during the aftermath of the Vietnam War, his focus broadened to include refugee studies. Rose writes beautifully, with emotion and grace about about matters that are fundamental to American national well-being and sense of cultural identity….He has the sociologist’s eye but his essays possess the flavor of personal commentary or journalism at its best; they are readable and perceptive…. Although it consists of previously published material, the quality of the writing and breadth of topics covered makes this a useful book for both general readers and specialists in refugee studies. I can’t think of anyone who writes with as much sensitivity, clarity, and conviction about race and ethnicity as Peter Rose. His writing is highly nuanced and sophisticated. Yet he invariably gets to the heart of an issue quickly and constructively. Peter Rose brings a unique perspective to the issues of race, immigration, refugees, and ethnic conflicts. He knows the issues as well as anyone but, in addition, knows the people involved. His personal experiences are key to the importance of his work. Tempest-Tost should be must reading for all those interested in these critical issues of our day.